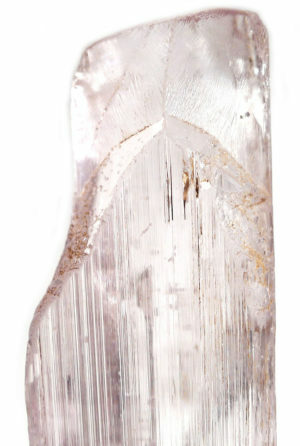 Spodumene is the name of a group of lithium minerals, which includes kunzite and hiddenite. Spodumene primarily occurs in lithium-bearing granite pegmatites, and is one of the major sources of lithium. 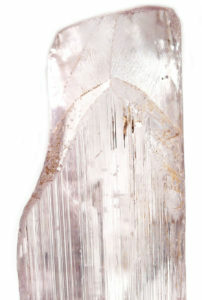 Most of the material mined is common opaque crystals; although spodumene is widely occurring, the coloured gem varieties – kunzite and hiddenite – are relatively rare. The colouration of kunzite, which is pink to lavender, is the result of included manganese; while hiddenite, which is green, is coloured by the presence of chromium. Hiddenite was at one time believed to come only from Hiddenite, North Carolina, USA, but over the past few decades has been mined in Afghanistan and Brazil, the latter producing some very rare bright green gemstones. 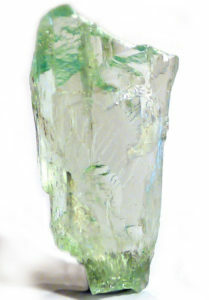 Kunzite and hiddenite are rarely faceted or carved, but are occasionally cut en cabochon, and are mainly available as mineral specimens. Spodumene is from the Greek spodumenos, meaning “reduced to ashes”, alluding to the greyish white mass that is formed when the mineral is ignited. Kunzite was named after George Frederick Kunz, the American gemologist who first described it in 1902. Hiddenite was named after the mineralogist William Earl Hidden (1853-1918). Spodumene was discovered in 1877, but the gem varieties, Kunzite and Hiddenite, were not recognized as the same mineral until 1879. Because of its relatively recent discovery, there are no ancient traditions associated with spodumene.